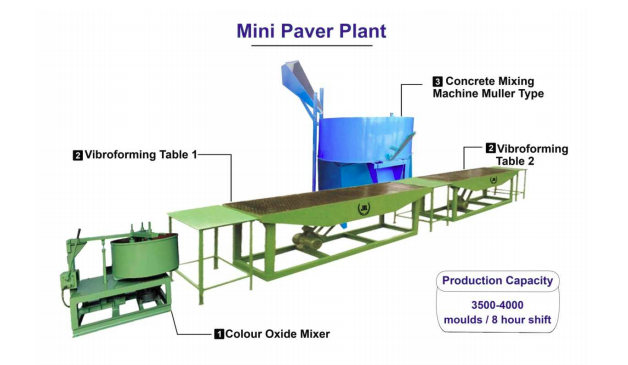 Mini Paver Plant : Mini paver plants are mainly used for paver production, which includes two vibroforming tables, pan mixer for color mixing and a concrete mixer with hydraulic hooper. It has an 8mm plate with 3000 drill holes approximately and a 3 phase motor attached with it. Apart from this it also includes three vibroforming tables and other concerned accessories. A large number of fully finished paving blocks can be produced from these machines in different colors,shapes and patterns. 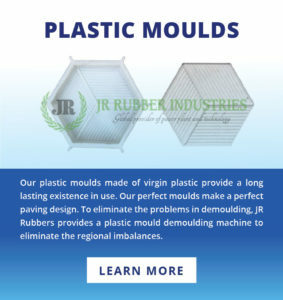 The vibroforming concrete interlock or tile making machine is involved with the automatic movement of the rubber mould. This particular machine includes certain important parts that are, Hydraulic muller type grey mixer with hydraulic hooper and a paver mixer machine for the color layer mix. The advanced technical assistance are also provided along with these machines for efficient production. 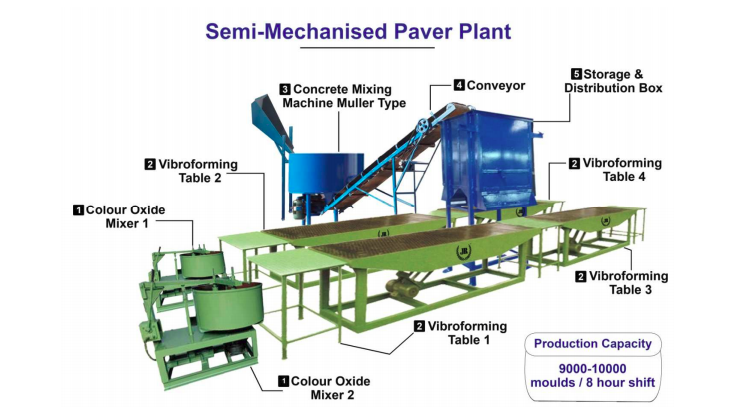 Semi-Mechanised Paver Plant : Semi-mechanized paver plant has more production capacity as compared to the Mini paver plant. This machine is well structured with four vibroforming tables, two pan mixer for color mixing, concrete mixer with hydraulic hooper, conveyor belt and a distribution box. The vibroforming concrete tile making machine is designed in 8mm plate with 3000 drill holes approximately. It has two 1.5 HP 3 phase motor with three vibroforming tables and all other concerned accessories. The color layer mixer machine have a production capacity of 150 kg per each batch and high standard 3hp Electric Motor for power supply. The hydraulic muller type grey mixer machine has a production capacity of 500kg per batch with a hydraulic hooper. The conveyor nylon Conveyor belt has a size of 20ft and with a 3hp motor and all other concerned accessories which are necessary. 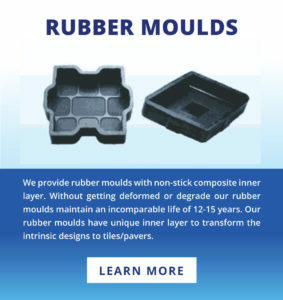 Rubber tiles manufacturers in India and many other countries are using this particular machinery features. Fully Automatic Paver Plant : The fully automatic paver plant helps to reduce manpower and effective utilization machinery resources, which helps in ease of operation and provides enjoyable working atmosphere. This particular machine helps in Avoiding duplication of material handling and make it more easy. The use of fully automatic machines helps us to save a lot of time and thereby generates a rapid increase in the production. Vibroforming paver making helps to produce a well structured and fully finished products and it delivers finest quality products as the end result. Vibroforming tables have a huge capacity to produce standard products by using high grade raw materials. This particular machine has a high efficiency and less maintenance. It is supported by a capacious infrastructure with a precision-engineered assortment of vibroforming tables. 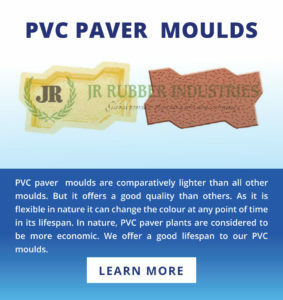 Apart from the usage in paver production, which is also used for packaging, product settling and compaction of containers moulds in diverse industries. Patrons can avail a high range of products in various sizes,grades and dimensions as per their detailed specifications. It has a production capacity of 3000 sq.ft in an 8 hour shift for tiles and for interlock paving blocks it is 2000 sq.ft per 8 hour shift. The movement of the products through vibroforming tables is processed automatically with a well sorted technical assistance. A large variety of Parking tiles and Floor tiles can be produced by using these machines with demanding quality. We can produce any kind of paving blocks in any shape with the help of well equipped machinery features, which ensures high durability.